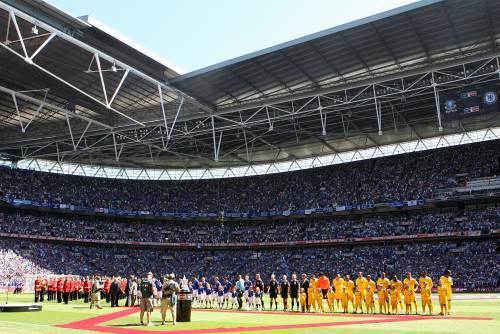 It’s being reported this morning that ITV are planning to put the FA Cup Final back to 5:30pm in an attempt to ‘freshen up’ and ‘bring back the magic’ of the competition. “The FA Cup has a great tradition and we see no reason to depart from that by moving it to an evening kick off. It would be hugely unpopular with supporters and would damage the famous competition. The final has always traditionally kicked-off at 3pm and has only ever deviated three times since the FA Cup was first contested in 1872: In 1873 it began at 11:30am so as not to clash with the Boat Race, in 1896 it began an hour late and in 1923 the kick-off was delayed for 45 minutes due to crowd congestion. Personally, it make no difference to me as there’s no danger of me having any vested interest in either of the two teams competing (Forest fan) but money talks (or rather screams like a howler monkey with it’s nadgers caught in a bear trap) in football these days so expect to see the final bumped back sooner rather than later – all in the name of ‘progress’. Personally I cannot see how moving the Cup Final to 5.30pm will create any problems whatsoever – and it can hardly be called ‘the evening’ now can it? 5.30pm would give everyone the opportunity to do what they would normally do upon a usual Saturday outside of the football season that is and then sit down at the pub, at home or wherever to watch the game and be able to continue afterwards with the celebrations or whatever. I agree the TV companies are manipulating kick off times but if it was your business and you were paying a hefty fee to televise the most important domestic match of the season, wouldn’t you want to maximise your viewing figures and in ITV’s case be able to increase advertising prices also? Be thankful you can watch it all, some of us will be lucky to see highlights, myself included, because of where we live in countries of little or no football on tv!